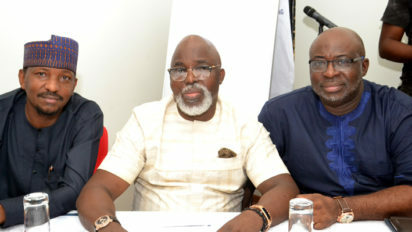 The Nigeria Football Federation yesterday in Lagos inaugurated the Reform Committee headed by the first Vice President of the NFF, Barrister Seyi Akinwunmi. Tony Ubani, Sports Editor, Vanguard Newspapers is also a member of the committee. The Committee which is peopled by experienced sports personalities was charged with initiating ways that can lead to the growth, development and transformation of football in Nigeria. Speaking at the inauguration ceremony, held at the Eko Hotel and Suites, Victoria Island, President of the Nigeria Football Federation, Amaju Pinnick said the committee would be given every encouragement it requires to succeed. The NFF boss charged the committee to bring up recommendations that would affect the fortunes of Nigerian football positively. Pinnick also promised to do everything to ensure the recommendations of the committee are implemented. “I cannot afford to assemble this calibre of people to come and spend their time and energies and not implement their recommendations. We will follow the committee’s recommendations religiously,” Pinnick vowed.